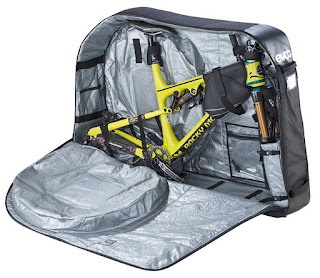 Bike Travel Bags: If you're loading up for a big trip, you really need an dynamic, strong bike travel bag to protect your bike along the way. That's exactly what EVOC has designed. The Bike Travel Bag is one of their most popular products - and for good reason - they've thought of everything you need. It's got wheels, padding, support rods, straps, compartments, and more than we can list here. 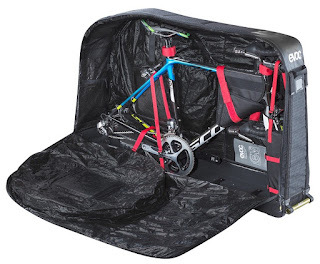 A "Pro" Bike Travel Bag version is available targeted to Road Bike users because it's got some additional support and features for road bikes. Bike Saddle Bags: Did you just get a new bike? Or maybe you've been looking for a while for the right small bike accessory to carry your gear, whether it's on training runs, cruising around town, or commuting to work. EVOC has a few different sized small bags to fit underneath your seat, that you can choose from to fit your scenario. 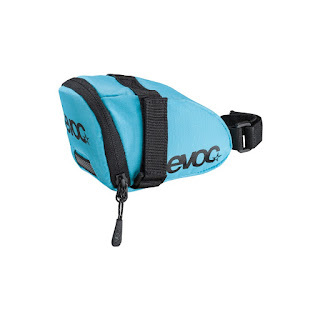 For a small, light option ideal for road or race bikes, there's the Small Saddle Bag. 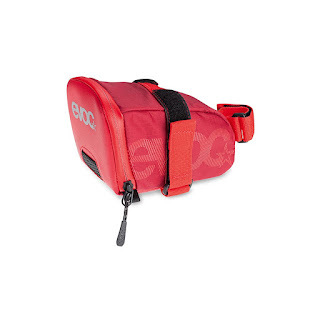 A slightly larger option is this Bike Saddle Bag, and for even more storage check out the Pro Bike Saddle Bag. They're all made of super durable material, weather resistant, and light weight.